The key advantages of a hammer tangential mill are the low energy consumption of the grinder and its extraordinary ability of simultaneous raw material grinding and drying. The other grinding units like a ball mill, rod mill, roller mill, pebble mill, do not have such ability to simultaneously dry and grind the material. An outstanding hammer tangential mill feature is the forced ventilation in addition to the high rotor speed. Together, these unique features of a hammer tangential mill improve the grinding quality and provide excellent raw material drying. The grinded material is unloaded from the grinding section into a separator where large particles are separated and return back to the grinding chamber to get grinded again inside of the hammer tangential mill until the generation of fine grinded product. The grinded and dried material gets unloaded from the grinder with a dust-air flow into the dust-laying system. 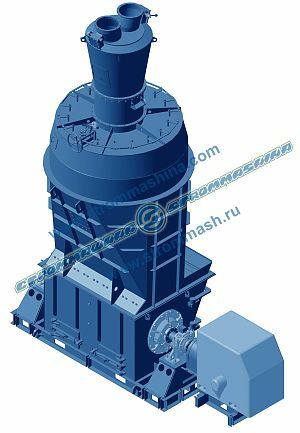 “Strommashina” is a highly reliable hammer tangential mills manufacturer. Our high standards, together with more than 50 years of grinding equipment manufacturing, make us one of the top grinding units manufacturers and specifically a top hammer tangential mill manufacturer.